Dunno about you, but #QPAT never really did it for me. Okay, it's opaque and puzzling – a bit like Qatar itself – but what would have been wrong with #QPDLADT? Well, it's long and unwieldy, and perhaps not right (check out French: given the profusion of definite articles, it's an inconclusive language). What about #Arc? Anyone use that? #Arc2017? Not many, by the looks of it. Anyway, that's done. 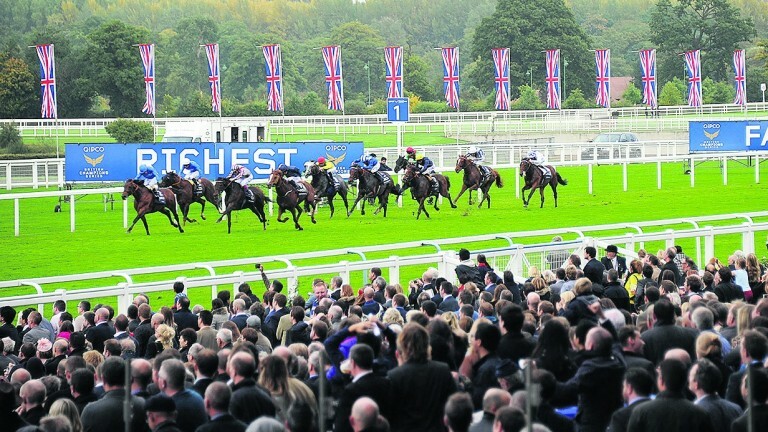 From one Q to another – Qipco, sponsor of the globe's most daredevil meeting, British Champions Day, destined one year, surely, to be completely washed out. But not so far. It's interesting to revisit the old world (in your mind; time travel not yet available). Just imagine if 20 years ago someone had said to you, "Champions Day is going to be great – and what's more, there's free WiFi now at Ascot." You wouldn't have had a clue what they were on about. Champions Day hadn't even been invented. Things have changed massively – and yet Ascot, founded 1711, is a constant, adopting the latest tech like a fresh pair of tailored shorts on ageing yet supple legs. It's the track at the leading edge of beer and hashtags, its latest being the magnificent #AscotBeerFest. No, wait, that's done too. They've gone back to racing. Now it's #ChampionsDay. Got to like that. Nice and simple. A hashtag someone could have understood before Twitter (except the #, which would have foxed them – as would Champions Day). And it's popular. Ascot (@Ascot) seems unconvinced though. At time of writing only one of its latest four tweets on the matter employed the hashtag. I'd count up further, but it would be pointless and time-consuming, like the road to the Super Bowl. The latest sample of anything – tweets, the road to the Super Bowl, cheese, you name it – is usually the best sample. Sadly all the good free Twitter analytics tools have folded or have started insisting on posting tweets for you, which reminds me of that time the police handed me a three-page statement I hadn't written, ready for me to sign. Witness statement, btw. Champions Day, if not the first, must be the biggest meeting to be launched in the online era and the organisation is switched on. The series itself might have fallen short of Game Of Thrones engagement levels, but the Day is a different matter. The Day has been embraced. It's billed as 'Racing's Big Finale', which is not far off the mark, and says 'We Are Ready, Are You?' Not really – but at least it means something. None of that 'Feel The Passion' nonsense. There are videos, although not all in the same place and not all on the Champions Series YouTube channel. You'll have to flit around their Twitter feed (@ChampionsSeries) and Great British Racing's (@GBRacing) to get most of it. GBR edges it with some good material, including this. And this, with that bloke. Chris Hughes. He's a star on the telly. Look out for the start, where he keeps talking even when his mouth closes. If that's not emblematic of something or other, what is? Actually, he seems okay. Perhaps you should watch Love Island. It might be great. He certainly helps get you ready for Champions Day, although it's unlikely you'll be able to spend it "chillin' with Frankie". BCS have been running videos of big events in 8-bit. Going by the number of views, you (yes, you) might not have known that. It's good, although you might find yourself stabbing at the screen to try to play the game. But you can't. It's just a video. Or maybe I'm just not technologically aware. For those who are already ready, BCS is offering to add a bit of stardust. To try to win a bottle of fizz and entry to the parade ring, share a pic of yourself and/or a friend preparing for the big day (and presumably holding your ticket) using the hashtag. An unthorough search suggests there are no entries. There are two examples from the organisers, both of a dog holding a ticket. So if you get in fast you've got a great chance of scooping the prize and if you don't invite a dog you'll have a unique edge. Are dogs allowed anyway? Not really. You might be ready for Champions Day but are you ready beyond it? Don't worry. It's all been mapped out by the "almost prophetic" Bill Gates. The future is most likely a deadly pathogen that could wipe out 33 million in a year. D'oh! Also, though, it's an enabling world of mobile banking in which the lives of the poor will be transformed. That must be only if they've got any money, which seems a flaw. But Gates reckons there won't be any poor countries by 2035, so there. Most people would probably go less extreme than Bill and opt for the children, or the next generation – something like that. It's a topic oft-debated in racing, while the sport peddles the same product it has for the past few decades, altered only by peripheral changes like modified whip rules and digital boards. Still, some of the next generation have been trying and a few months ago a Twitter account, Rein It In (@ReinItInRacing), popped up with a call for aspiring young racing journalists. Then nothing happened and it disappeared for ages. Now it's back. It can be hard to distinguish between grassroots and astroturfing but this looks earthy enough. A few writers have appeared and there's an embryonic website. It's early days and there's nothing there yet to concern Alastair Down, unless he'd be concerned that he's not 18 any more. But the spelling and grammar is pretty good and enthusiasm is evident. Even better, there's no self-consciously salty 'banter'. Would-be writers can apply with a form on the Twitter feed. They want to know what days you are free, so it sounds like there's a rota. Write – but don't let the system steal your youth! Is the home page where the heart is for racecourses? Can racing really cause a stir on Twitter or is it all just internal affairs?